As Mother's Day approaches, we are launching a special initiative to help 50 mothers who have children with special needs. By providing financial assistance for these children we can help the families secure uninsured medical costs or supplies. Children will be aligned with necessary medical care, therapies, medicines, equipment, lab work, imaging services and other related needs that fall through the cracks of existing insurance and social services programs. Your gift can make a difference! Amid the majestic mountains of Nepal, children living in poverty often struggle to stand. Every year 782 children in Nepal are born with clubfoot. Since the 2015 earthquake, 2,346 children were born with clubfoot and thousands more injured during the disaster. For the past 10 years, a team of fearless volunteers from the US have traveled to Nepal to bring their gift of healing. In one medical trip they can assess 70 patients, perform 55 surgical procedures on 20 patients. What an impact! Red Nose Day the HTC Way! Who can’t smile when you see someone wearing a red nose? It is the perfection of simple silliness. This Thursday, May 26 is Red Nose Day #rednoseday sponsored by Walgreens and others as a special day to come together to have fun and make a difference for kids. The power of humor and healing are well known and we can celebrate Red Nose Day by supporting the work of Healing the Children and its 16 chapters. What a great way to help a child access the health care they need and deserve. We believe in the power of healing to change lives for children. Won’t you be a part of our story? This is Daisy. Will you help Healing the Children give her the medical aid she needs? At four, she’s too young to yet realize the sadness of her disfigurement. But her mother does. We can correct this terrible tumor, either by drugs or by surgery. Thus, she, along with many other needy kids, will be the focus of a surgical mission planned for April. When our cute little kids come out of surgery in Peru, they are dressed in a hospital gown... but we want to show off their new smiles with a brand spankin’ new t-shirt, telling the world that their smile is via Healing the Children Northeast. We can put the kids in the t-shirts... but we need YOU to help us fund it. Each t-shirt is $15 and you will get some adorable photos of the kids on the back end. 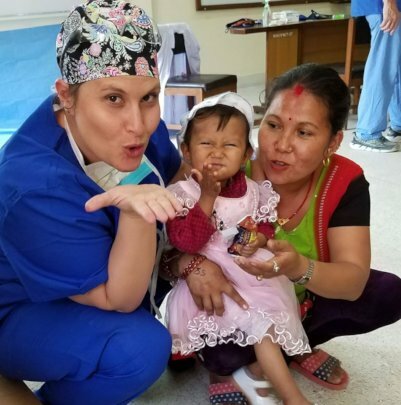 Help us spread the word to other families about our life-changing surgical team, visiting Peru twice a year to help kids with cleft lip and palate. The Wisconsin Chapter of Healing the Children is helping to raise funds to build a shoolhouse in the village of Teote in northern Nicaragua. Teote is a poor community that lacks strong institutional support for education or the means to provide the necessary infrastructure and educational materials. Our goal is to build a 3 room elementary school to serve about 80 children. The children are currently being taught in the teachers' homes. Healing the Children is committed to improving the lives, health, education, and opportunities of these children. Please consider donating what you can, and help us to spread the word about this life-changing project for the children of Teote.